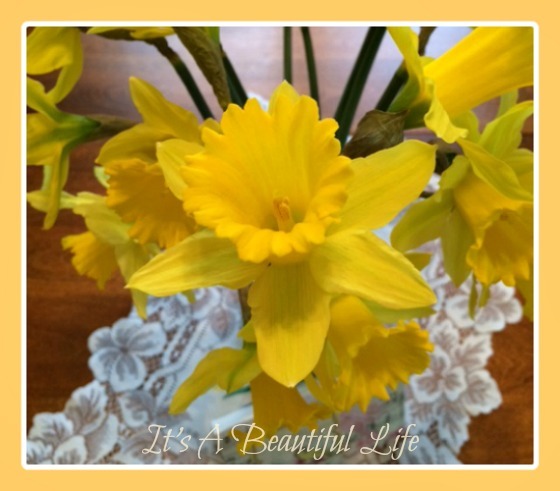 It's a wee post I'm offering this morning ... a simple feast of yellow daffs in a jar. Yet more than enough to get the heart pumping with gladness on a grey overcast morning. I'm away in a few minutes to pick up my mom who is staying with us for a few days, but I did not want you to think I forgot about you -- for I have not. In truth, I had another post started but it got complicated -- sometimes I just try to do too much in too short a time. I'm sure you wouldn't know about such things; I didn't have the time to uncomplicate it, and perhaps it's just as well. Simple is best. and dances with the daffodils..."
On that note, I wish you glimpses of heaven in unexpected places. 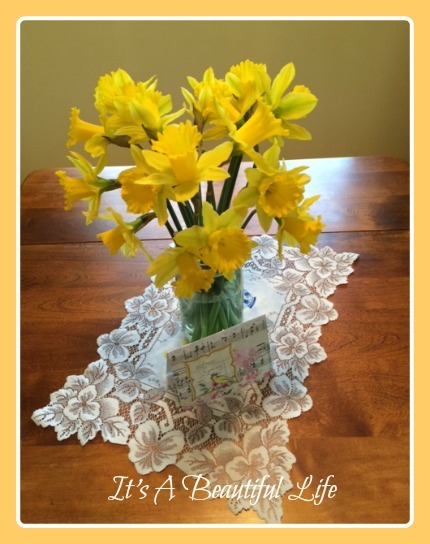 There is nothing like a vase of golden daffodils to rise the spirits! Dearest Brenda what a glorious and cheerful sight. Just beautiful friend. Thanks for sharing this delightful bouquet. Hugs! Daffodils shout, without a sound, Spring! What a delightful post...short but so full of PUNCH. Daffodils are the cheeriest flowers and certainly brighten up these grey spring days. Enjoy your visit with your mom - wishing you lots of joy together. daffodils are so cheerful. I missed seeing ours this year as they grew up inside a big palm bush and were covered! And there I was, wandering lonely as a cloud... until I saw this cheerful sight. I love your daffs in jars! They are beautiful. Alas, ours have to stay outside because of allergies present in our household. - But Spring is certainly supplying us with many samples from God's paintbrush! Aren't they just so gorgeous?! Enjoy your day and your time with momma. Blessings in unexpected places are the best and sweetest! May you as well experience them this week Brenda! 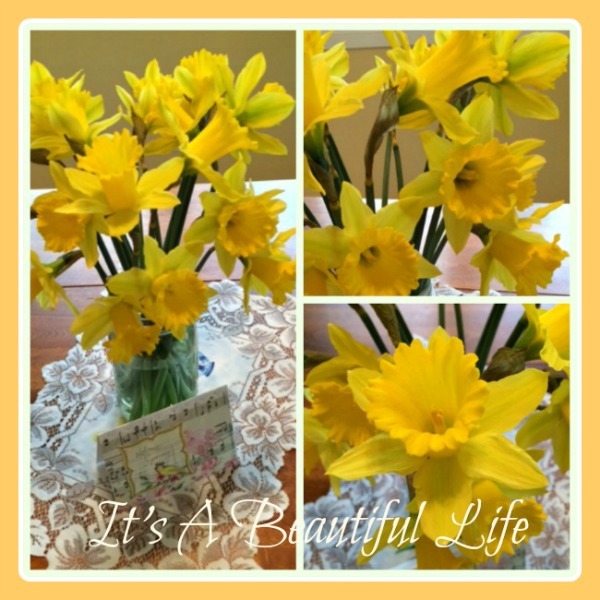 Daffodils are so cheerful. Have a wonderful visit with your mom, Brenda.